This moisturiser has a lovely texture, is totally non-greasy, easy to apply, and makes for a good make-up base for my foundation. The great gel texture is absorbed easily into the skin and absorbs straight away with no greasy feeling. I love the light, smooth feeling of the gel. I can feel my skin relaxing almost instantly. This is one of the nicest facial products I have ever used. No fatty skin, no pulling due to not moisturising enough, just perfect for combination skin so definitely 5 stars in my book. Week 1: I was pleasantly surprised to find a glass container in the box… as I was expecting a plastic container. Once I took of the screw lid, I had to remove the foil cover from the glass jar. My first impression: WOW – this container is literally filled to the brim! Which was a first for me as many other products look a lot less once you take off the lid – almost half the container. This has the same fresh “crushed watermelon & cucumber” smell to it – not at all overpowering, but in fact very relaxing. The color is a light, yet bright turquoise color and the consistency of this gel/mask is extremely light. Not at all anything like a moisturiser. I used an almond size amount of the gel and it went on easily over my face and neckline. Although you might start getting concerned that the product is not being absorbed and your face still feels “wet”, once you touch your face, you will find that it was all absorbed. Which was an amazing feeling. At this stage however I still put an evening moisturiser on over the product at night. Stunningly priced at R60! Week 2: I am still so impressed with this product! I have however noticed that this product is not suitable for “layering”. The moment you start layering another product over this, the gel start “crumbling”. So I now use this product at night to refresh and hydrate during sleepy time and on the days I don’t feel like make-up. I also need to say that (once again) my husband has now also started using the product after shaving! He says the product is fast absorbent, hydrating – which is essential after shaving (I would guess), as well as the fact that it doesn’t have a sticky feeling to it. Both of our skins are highly sensitive and this product absolutely works like a charm for us! 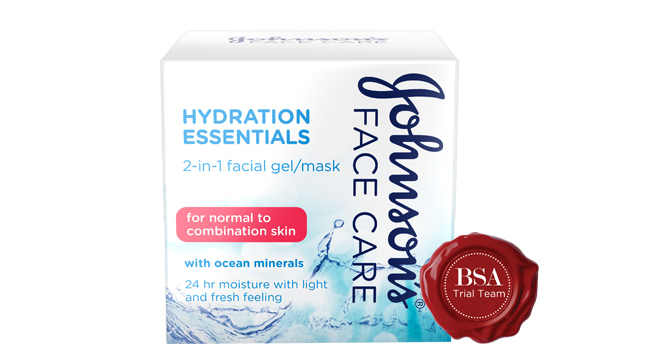 With beautiful blue packaging and the freshest summer scent, Johnson’s Hydration Essentials are a stand out on the shelf and a pleasure on the nose. The product, aiming to cleanse whilst maintaining a perfect level of hydration for your face, has been a pleasure to use. My combination skin often exhibits any oily T-zone with dry patches elsewhere. The blend of Johnson’s Hyrdation Essentials gel cleanser and 2-in-1 gel moisturizer have mastered the perfect blend for me, leaving my face soft and clean, without an embarrassing T-shaped sheen. I actually tore the packet open to see how it looks inside because the packaging itself looked so pretty. It felt like it was my birthday and it made me feel so special. I liked the ribbon idea and the inside looked nice too. It’s my favourite colour & I love it. The Hydration Essentials 2-in 1 Facial Gel / Mask is a good product and it is so awesome that it’s 2 in 1. I especially love the way it smells & that goes for the other 2 products as well. Week 1: I received the Johnsons products in good order and in a well-presented box. The products are packaged in fresh calming colours, something that I so loved when I saw them. I immediately got down to trying out the items. Firstly I used the skin care wipes. They glide so softly onto my skin, cleansing and moisturising at the same time. I washed with the facial cleanser and lastly used the mask according to package instructions, so far so good. Week 2: I made use of product as per package instructions the 1st 2 times I used it and I found it made my skin tingle. I thought it’s probably adapting to my skin, however the 3rd time I used it my cheeks burned and the face tingling was more pronounced. I had to discontinue usage but my spouse is sure enjoying the mask as it does not burn his skin, although it does tingle though. I was skeptical about this product and I was a bit too mean. The gel consistency had a great effect on my skin. I also use it as a make-up base and it works relatively better than my current moisturizer.